Tim recently completed his undergraduate degree with Alexander Janiczek at the Guildhall School of Music in London where he was awarded a Concert Recital Diploma and the Lord Mayor’s Prize for the highest mark across the music department, and was subsequently invited to return as a Chamber Fellow. Born to two violinist parents, Tim attended the Royal Academy of Music from the age of 4. He was also a chorister at the Temple Choir in London, and head chorister for his final two year, recording disks for both Signum and Decca labels. Starting his first serious string quartet in 2011, the Celan Quartet, he has been a regular at many of the chamber festivals both in the UK and abroad. Now a member of the Barbican Quartet, who recently won the Royal Philharmonic Society Eugenie Frost Music Prize, as well as support from the Hattori Foundation and winning the St James’ Chamber Music Prize. Tim has attended the IMS Prussia Cove masterclasses since he turned 18, and in 2018 was invited to play on the IMS Open Chamber Music Tour, ending at the Wigmore Hall in London, alongside artists such as Adrian Brendel and Las Anders Tomter. Tim has performed alongside artists such as Steven Isserlis, Lawrence Power, Alexi Kenney, Philippe Graffin, Amy Norrington, Alasdair Beatson, Bengt Forsberg, Timothy Ridout, Paolo Giacometti. 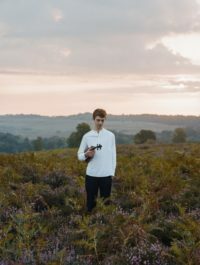 He is a regular of Musikdorf Ernen, IMS Prussia Cove, Lewes Chamber Festival and and looks forward to attending the West Wycombe Chamber Festival and Resonances festivals this year. He has also recently been asked to lead the new string ensemble set up by Lawrence Power, Collegium. Tim plays a Ferdinand Gagliano, c.1770.